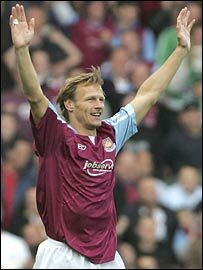 West Ham striker Teddy Sheringham says he wants to share the field with son Charlie before he retires from playing. Sheringham Sr turned 40 on Sunday and became only the second outfield player after Gordon Strachan to play in the Premiership past his 40th birthday. "Charlie's 18 next month and on trial at Crystal Palace at the moment after being released by Ipswich," he said. "I hope I can play against him. We're similar so I can see what he's trying to do, there's no better advisor." If young Charlie does want advice on how to succeed in football, there are few people better placed to offer it than his father. In a hugely successful 22-year career, Sheringham has played under high-profile managers including George Graham, Brian Clough, Terry Venables, Kevin Keegan and Sir Alex Ferguson. He has scored 344 goals in 860 senior appearances for Millwall, Nottingham Forest, Tottenham, Manchester United, Portsmouth and West Ham, and 11 goals in 51 games for England. Along the way, Sheringham has been named Players' and Football Writers' Player of the Year, won the treble with Manchester United - "11 great days which I wouldn't change for anything" - and played in European Championships and the World Cup. But the man Sheringham credits with kick-starting his career is one of his lesser-known managers - John Docherty of Millwall. "When he got the manager's job at Millwall, he had faith in me," he said. "I don't know if he didn't have any money to spend, but he worked with me and was really good for me at that time." Sheringham is one of football's late bloomers - he did not make his England debut until he was 27 in a 1993 World Cup qualifier in Poland. And although he went on to win 51 caps, he admits there were times when he thought his career was over before it had begun. "There were times when I thought to myself 'I'm not going to make it,'" he said. "I remember my second game for England - we lost 2-0 to Norway, I was subbed and didn't do myself justice and I thought that was the end of my England career." Sheringham's finest hour-and-a-half in an England shirt was his two-goal man-of-the-match display in the 4-1 crushing of Holland at Euro 96, and being part of Terry Venables' England set-up is something he remembers fondly. "Scoring two goals at against Wembley against a Dutch team that was supposed to rip us apart and ripping them apart - it doesn't get any better than that," he said. "Every manager I've played under has been good for me at that stage of my career. Terry Venables was good for me then. "He gave me that edge of 'you are a very good player, I want you to be great' - without actually saying it, it was case of 'you've got it son, go out and show other people'. As he turns 40, Sheringham's appetite for and ability in the game show no signs of weakening, with the lure of a possible place in Europe with West Ham next season to keep him going. "Last season we scraped into the Premiership so everyone expected us to falter," he admits. "But the manager's bought wisely - the players who've come in have taken us on to a different level and the players who won promotion have also performed at the top level, so long may it continue." When his playing days are over, many people have tipped Sheringham to enter coaching - "I don't want to do it yet, but I might consider it" - and he himself has talked of playing professional poker. But as long as he is still good enough and hungry enough, those playing days look set to continue for a while yet - at whatever level. "I've already dropped down a division to the Championship when I joined West Ham," he said. "I'd look at any offer. If I didn't want it I wouldn't go for it, but if there was job satisfaction and I'd enjoy, then I would contemplate it."